... This will be primarily a clothes swap for our Blythes, Pullips and Dals. Your package must include 3 items. You package can contain clothes, furniture, accessories, or any other item that your partner might want or need. If you and your partners want to make more then 3 items for each other, that is fine, but make sure you discuss it with each other first! Make sure you let me know if you have a Blythe, Pullip, and/or Dal. I will NOT match a Blythe person with a Pullip person or Dal person! Partners will own the same type dolls. And you must own a Blythe, Pullip or Dal to participate. Please don't start crafting until you are assigned your partner and please make sure to read their questionnaire and craft for them as best as you can. Send 3 items. At least 2 must be crafted. I think it is a fun idea to post pictures of your dolls with their names in this thread. You do not have to wait to know who your partner is to do this but DO NOT do this until you have sent me your questionnaire. 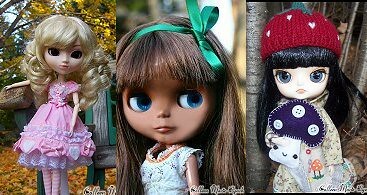 Names and types of dolls (Blythe and/or Pullip and/or Dal, AND body type!) you would like things made for? I wish I had one or two and I'd join! There was a lot of interest in this swap, and I hope to see more people join soon. I'm hoping to sign up for this, but I have two swaps in which I'm behind right now, so I have to worry about those first! Thanks for organizing GatorWrangler! I'm so excited and just sent my questionnaire in. My Pullip needs some new clothes to go with her new look. I sent in my info too yay!! Very tempting swap! I'm thinking about this one! My girls could use just about anything!